Rear Admiral MD Suresh, AVSM, NM relinquished his responsibilities as the Deputy Commandant and Chief Instructor, Indian Naval Academy, after a successful tenure of three and half years, today, Monday, 29 January 2018. Rear Admiral MD Suresh, NM took over as the Deputy Commandant and Chief Instructor of the Indian Naval Academy on 14th of July, 2014. During his tenure, the Academy saw a paradigm shift in the training methodologies and completely overhauled the training process that resulted in overall and wholesome development of cadets. He was instrumental in implementing higher standards of physical training at the academy that resulted in INA winning the prestigious annual Inter Services Officers Training Academies sports meet, the Bakshi Cup 2017, for the very first time. 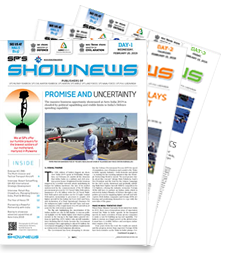 The win was a symbolic achievement that signified the growth of INA, which is a relatively new academy, at par with the older and more well known academies like National Defence Academy, Khadakwasla and Indian Military Academy, Dehradun. The Flag Officer is proceeding to New Delhi and take over as Assistant Chief of Integrated Defence Staff in Headquarters Integrated Defence Staff (HQ IDS). 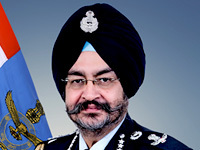 The Admiral is an alumnus of National Defence Academy at Khadakvasla, the 'Defence Service Staff College' at Wellington in the Nilgiris and the College of Naval Warfare at Mumbai. He was a member of the 'Around the World Sailing Expedition' on sailing vessel 'Samudra' during 1988-89. Rear Admiral MD Suresh, NM has over thirty five years of rich and varied experience in the Indian Navy. 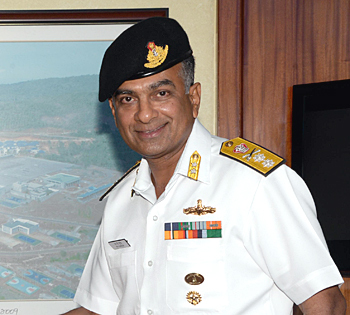 The Admiral, prior to taking over as the Deputy Commandant, INA was the Flag Officer Doctrine and Concepts (FODC) at Headquarters Western Naval Command, Mumbai. He has held a mix of operational and staff appointments. He was selected to commission the Indian Navy's first stealth frigate INS Talwar, as the Executive Officer, in St Petersburg, Russia. He was also the commissioning commanding officer of the Indian Navy's first indigenous stealth frigate INS Shivalik. He was also did a stint aboard as the Defence Advisor to the embassies of India in Oman, UAE, Qatar, and Bahrain. His earlier appointment in IHQ MoD (Navy) was as the 'Principal Director' in the 'Directorate of Naval Operations'. In recognition of his exceptional dedication to the service and the country, the Admiral was awarded the Nao Sena Medal in the year 2000. The Admiral was conferred with Ati Vishisht Seva Medal (AVSM) on the eve of the recently concluded 69th Republic Day Celebrations by Honorable President of India Shri Ram Nath Kovind. The Admiral leaves the Indian Naval Academy finally on the path of "Shaping Future Naval Leadership". Rear Admiral MD Suresh, AVSM, NM handed over the duties of Deputy Commandant and Chief Instructor to Commodore Arjun Dev Nair, VSM, Principal Director (Training).